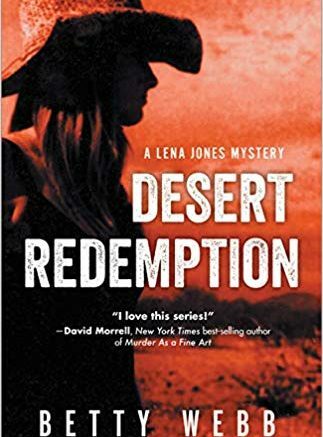 1) When you began to write the first Lena Jones novel, Desert Noir, did you ever imagine the series would extend to ten books? From the night back in 1999, when a PI named Lena Jones came to me in a dream, I always envisioned ten books — but why, I really don’t know. But the entire series was laid out for me that night, from a four-year-old Lena being shot in the head and abandoned on the street, to her final understanding of the events that led to the crime — who had committed it, and why. 2) Who in the crime fiction field had you been reading for inspiration leading up to your decision to try your hand at a novel? 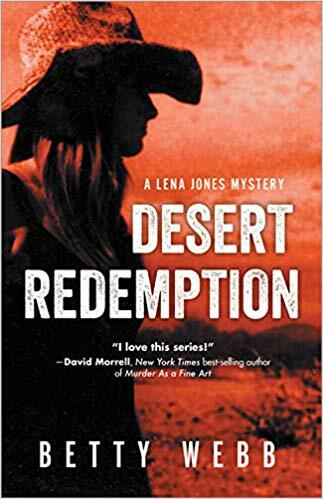 3) Desert Redemption, your tenth Lena Jones mystery, has been announced as being the last in this critically acclaimed series. What led you to this decision? Again, from the first book — “Desert Noir” — I knew the series would end at ten books. And I used that final book to let Lena solve all the mysteries about her own life, not just other peoples’ mysteries. Saying goodbye to Lena has turned out to be more difficult than I originally thought, because over the years she became the daughter I never had. 4) Several of the Lena Jones novels have revolved around hot button topics, particularly those dealing with women’s issues. Did you intend to make this a feminist crime series from the beginning? Absolutely. I’d been reading a plethora of books starring feminist PIs, and I eagerly joined the crowd. But because of my work as a journalist, I was also exposed to certain secretive groups whose crimes against women and children were under-reported. We’re talking polygamy, female genital mutilation, etc., — so I reported them in the pages of my books. 5) An approach to this series that may be unique is that Lena’s own past traumas are continuously being investigated and unearthed from book to book, regardless of the specific case she may be working on at the time. Did you have the entire arc of Lena’s history plotted out from the very first book? I saw everything about Lena’s life in that dream I had almost 20 years ago. It was a strange experience, almost mystical. 6) Your Gunn Zoo series, which you have been alternating with the Lena Jones books, has a much lighter tone. In the absence of Lena, will you be creating a new second series with which to alternate? Yes. My new series, which I’ll begin as soon as I finish “The Panda of Death,” will be a historical mystery set in another country. In tone, it won’t be quite as dark as the Lena Jones books, but also not as “light” as the Gunn Zoo books. However, the sleuth in the new series will be every bit as feminist as Lena. In fact, I’ve played around with the idea that Emma — she’s my new protagonist — is Lena Jones’ great-grandmother. For now, that’s all I’m going to reveal. 7) As a former newspaper reporter, did you ever cover a story that you wish you could have incorporated into one of these novels but couldn’t find a way to do it? Yes. Without going into too much detail, I was once sent out to cover the suicide of a famous person. I tracked down a relative who was clearing out the dead person’s place of residence. Surprisingly, she was more than willing to talk to me. In fact, she was so emotionally distraught she actually grabbed my arm and pulled me into the house. As a result, I wound up having a long, long conversation with her while she mopped up the suicide scene (it was very messy). Only minutes into the conversation I realized there was no way I was going to write up what I was hearing; it was too emotional, too intimate. So instead of being a reporter, I became a shoulder to cry on. Be the first to comment on "Interview with Betty Webb author of “Desert Redemption”, the Final Lena Jones Mystery"